I knew nothing about pool plaster. So I went to the NPC Show. You are here: Home / Blog / I knew nothing about pool plaster. So I went to the NPC Show. I have never plastered a pool in my life. In fact, until this week, I had never even seen pool plaster being applied. To be honest, I did not even know the difference between plaster, cement, gunite, concrete, shotcrete, or any other type of -crete. 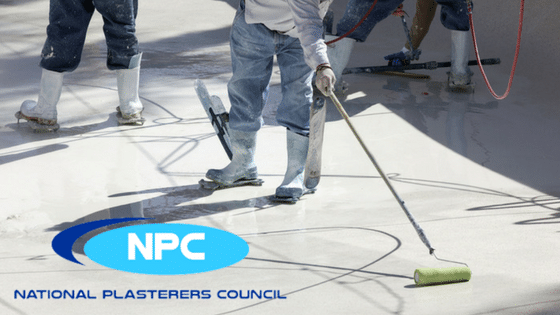 Because of this utter lack of knowledge and experience, I thoroughly enjoyed my time at this year's National Plasterers Council (NPC) annual conference in New Orleans. When you think of concrete or plaster, you may not think there's much science to it. For me, I visualized mixing concrete in a wheelbarrow for a basketball hoop, then signing our names in it before it dried. Not exactly complicated chemistry. Well, think again. These people are the real deal, and they know their trade inside and out; chemistry being an integral part of the pool plaster business. That said, here are some things I learned, in novice terms. Pardon the lack of technical detail. Orenda has written at length about calcium hardness, carbonate scale and their relationship with the LSI. But calcium is way more important than I thought. For instance...did you know there are big differences between calcium chloride, calcium carbonate and calcium hypochlorite? I'm no chemist, but that's a lot of calcium variations to understand. But perhaps none are more important in the pool plaster trade as calcium hydroxide...a compound I had never heard of before. So what is calcium hydroxide (Ca(OH)2)? As I understand it, when plaster cures and hydrates, calcium hydroxide is released. This calcium hydroxide has a high pH of 12.6-12.8, and raises the LSI in its immediate vicinity, and carbonates into calcium carbonate (dust). If it isn't brushed off, acid washed or chelated quickly enough, this dust will harden and dull the appearance of the pool surface. This is why startups take several days. It requires diligence and persistence to control calcium hydroxide deposits from marring a beautiful pool plaster finish. Unlike most types of cement or concrete, pool plaster is not structural or structurally reinforced. It does not obey the same norms as typical concrete application. So rather than just letting it 'dry' to cure, part of the curing process for new plaster actually occurs underwater. Why? Because the calcium oxide (CaO) in the plaster needs to hydrate in order for the cement to harden. The hydrated calcium oxide bleeds off calcium hydroxide (Ca(OH)2). This calcium hydroxide within the surface, but too often it is sucked out by low-LSI water, and carbonates as plaster dust outside the surface. An acid wash involves garden watering pails, a hose with a sprayer nozzle, dish soap and a bunch of safety equipment (to protect from burns from the muriatic acid). Essentially, they hose down the new plaster to get it wet. They mix in dish soap into the acid so that it holds to the plaster a while longer (and doesn't streak down the pool wall too fast), and evenly pour acid down the sides of the pool. This acid wash reacts quickly with plaster to remove the 'film' and expose the beautiful plaster and aggregate beneath. Some plasterers rinse it off immediately with water; others, like Tempool Inc., have found its better to neutralize the pH before rinsing. Everyone has their own way of doing it. Get that acid off the plaster and begin filling the pool. As this is done, NPC veteran experts recommend using a sequestering or chelating agent like SC-1000 to hold calcium and other metals in suspension during initial fill. This helps reduce (or even prevent) staining, scale and plaster dust before the plaster has hydrated and finished curing. It is also essential during these initial several days that the pH, alkalinity and calcium hardness allow for a balanced LSI. Keep the water temperature in mind! As was repeated over and over in the classes, test the fill water for calcium hardness before filling the pool. Make sure there is enough calcium so that the plaster does not get etched. For salt pools, be aware of its impact on pH. When salt (NaCl) reacts to become chlorine, the byproduct is sodium hydroxide, which has a high pH of 12-13. That will certainly have an impact on your pool water chemistry and plaster. Alkalinity...specifically carbonate alkalinity is important at this time too. Between alkalinity and calcium, the pH should have a buffer from fluctuation...but in these early days, pH will rise if the LSI is too low. Carbonate alkalinity is basically total alkalinity, with the adjustment for cyanuric acid. This factor is important when calculating the LSI (which, by the way, the new Orenda mobile app has an LSI calculator built in, and does all this math for you). Refer to the NPC startup guide for more information. One of the classes I attended talked about how high levels of cyanuric acid (CYA) not only affect chlorine usage, but also test readings. Apparently, most water test kits do not let you accurately test CYA levels over 100 ppm. But in reality--especially for pools using Trichlor or dichlor--CYA levels can be much, much higher. It requires a dilution, which is a big pain. It also contributes to total dissolved solids (TDS), which leads to more problems. The other issue with cyanuric acid, as mentioned before, is it's affect on the LSI. Without an accurate reading of CYA over 100, there is no way to calculate carbonate alkalinity (CYA adjusts the total alkalinity to find the carbonate alkalinity). With really high CYA, your pool could actually be very corrosive on the LSI, and you may think you're in a healthy range. Be aware of it. I'm going to learn how to plaster a pool. This is my ultimate take away. If I'm going to be in this business and work with the pool plaster professionals, I need to spend time in their spike shoes and physically plaster a pool with them. Fortunately, I have had no shortage of invitations to help their crews. I'm looking forward to it.